WASHINGTON, Aug. 28, 2014 - Defense Secretary Chuck Hagel today presided over the U.S. Special Operations Command change of command ceremony in Tampa, Florida, where Army Gen. Joseph L. Votel III (seen in his offical DoD photo above) assumed command from Navy Adm. William H. McRaven. McRaven, who's served as the command's chief since Aug. 8, 2011, has been named as the next chancellor of the University of Texas. 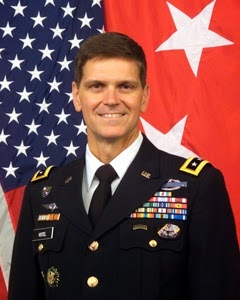 Votel most recently served as commander of Joint Special Operations Command. A full account of McRaven's career has yet to be written, Hagel said in his prepared remarks. "When it is, it will have to be heavily redacted," he joked. "But his legacy in the special operations community is already secure. He is a warrior-leader that generations of special operators from across the branches of service will strive to emulate," Hagel said. 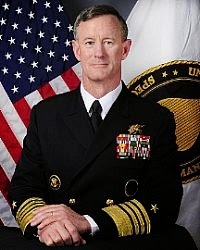 Career milestones McRaven (seen in his official DoD photo above) has been deeply intertwined with the history of special operations in this country, the defense secretary said. "He helped establish and was in the first graduating class of the Special Operations/Low Intensity Conflict curriculum at the Naval Postgraduate School," Hagel said of McRaven. "He literally wrote the book on special operations -- I'm told that his graduate school thesis at one point outranked even Clausewitz on Amazon's list of military strategy bestsellers. "As the commander for special operations in Europe, he was the driving force behind the creation of the NATO Special Operations Forces Coordination Centre," the defense secretary continued, "and under his leadership, the Joint Special Operations Command carried out perhaps the most important mission in their history -- hunting down and killing Osama bin Laden." McRaven led the special operations community as it transitioned from the era of post-9/11 conflicts and into confronting the next generation of dynamic, dispersed, and networked challenges, Hagel said. "Special operators have long been the vanguard of our military's global engagement, epitomizing the kind of far-reaching work that our military will be called upon to do in the future," the defense secretary said. "What special operators do every day not only helps make America safer, it also directly contradicts the uninformed and false narrative that the United States is pulling back from the world,"
Hagel said. Special operations forces deployed into more than 150 countries under McRaven's command, he noted. "In fact, Socom and the entire U.S. military are more engaged internationally than ever before -- in more places and with a wider variety of missions," the defense secretary added. Special operations missions under McRaven included delivering life-saving relief after Typhoon Haiyan struck the Philippines in 2013, Hagel said. "They helped Peruvian forces successfully target two senior members of the Shining Path rebel group. They're working with African partners to help counter the terrorist activities of Boko Haram," he said. In Iraq, special operations forces are helping strengthen Iraqi security forces in their fight against terrorist forces from the Islamic State of Iraq and the Levant, the defense secretary noted. "And in Eastern Europe, they are reinforcing NATO allies in light of Russian aggression in Ukraine," he said. During his time in command, McRaven organized Socom's forces to be more agile, flexible and responsive, Hagel said. "He has better integrated Socom with the geographic combatant commands, and issued the first-ever Global Campaign Plan for Special Operations," he said. "He has deepened our relationships abroad, working more closely with allies and partners to better anticipate and counter threats. " As a testament to the growing demand for special operators," the defense secretary continued, "Socom has grown by almost 8,000 people over the past three years -- and its growth will continue even as other parts of our military draw down.". Repeated deployments have dealt the special operations community a heavy burden, Hagel said, but McRaven and his wife Georgeann have worked tirelessly to help alleviate some of the strain. "[McRaven] established initiatives to address the physical and mental well-being of his force, offer support to family members, and provide more predictability on deployments. He modified Socom's definition of readiness to include families as a vital part of the equation, something the entire Department of Defense can learn from," he said. And Georgeann has been a consistent advocate for special operations families, personally supporting many of these important initiatives, the defense secretary said. "The McRavens live by the [special operations] community's saying ... 'Our people are more important than our hardware,'" Hagel added. Votel is a worthy successor to McRaven, the defense secretary said. "[His] quiet, decisive leadership -- combining both operational and strategic expertise -- is precisely what this command will need as we confront the next generation of threats to our national security," Hagel said. Both men know that an institution is only as strong as its people, Hagel said before thanking the special operations community for their sacrifices, particularly over the past 13 years. "Your skill, your agility and your dedication are what make you so often the force of choice for our highest priority missions," the defense secretary said. "And a special thank-you to your families, who make untold sacrifices and never get the amount of recognition and appreciation they deserve." "In a complicated and combustible world, this community is a precious national asset," Hagel said. "All Americans are inspired by your strength, determination, and devotion to duty."